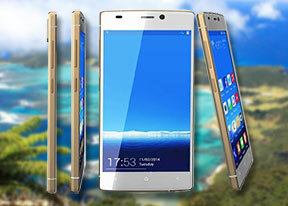 The Gionee Elife S5.5 runs on a MediaTek MT6592 chipset with eight Cortex-A7 cores clocked at 1.7GHz each. Graphics are powered by an aging Mali-450MP4 GPU, and there is 2GB worth of RAM on board. GeekBench 3 and AnTuTu 4 are benchmarks, which put to the test the hardware combo inside the smartphone. GeekBench 3 is more CPU-intensive, whereas AnTuTu 4 is a truly compound benchmark - testing CPU, GPU, memory performance, etc. The Elife S5.5 was able to post respectable scores next to other top flagships, but the less capable GPU takes its toll on the AnTuTu test. Basemark OS II is another all-round benchmark. It gives an overall score along with single-core, multi-core, and math performance, among others. We focus on the overall and CPU scores. The CPU scores are quite decent and prove the eight Cortex-A7 cores do a similar job to a quad-core Krait 400 processor. But the underperforming GPU and the lower memory bandwidth add for a significantly lower overall system rating. Next up we have GFXBench's 2.7 T-Rex. The 3.0 Manhattan test isn't available on the Gionee Elife S5.5 as its OS is based on Android 4.2, which lacks the proper OpenGL drives, courtesy of Android 4.3 and above. Just as we thought, the old generation Mali-450MP4 GPU is far less capable than the current Adreno crop and it posted very poor scores on both offscreen and onscreen tests. The Gionee Elife S5.5 isn't quite able to stand up to the current flagship crop mostly because of its older generation GPU and the unimpressive web browser performance. It will do OK on popular games no matter the GPU benchmark scores, but it definitely needs some tweaking in the web department.